New loan signing Joe Powell says he is going to ‘relish this opportunity’ to do his bit to help the Cobblers climb up the Sky Bet League Two table. The 20-year-old signed from Premier League outfit West Ham United for the rest of the season on Monday afternoon, and is set to make his Town debut in Saturday’s crucial clash with Morecambe at the PTS Academy Stadium. If he does feature it will be the attacking midfielder’s Football League debut, although he has played for the Hammers first team in the Carabao Cup, as well as their Under-21s in the Checkatrade Trophy. But it is the chance to play competitive men’s football week in, week out, that has enticed Powell away from life at the London Stadium and to the less glamorous surroundings of the PTS. He appreciates where the Cobblers are currently positioned in the league two table, but he is keen to get stuck into the challenge and show exactly what he is all about. “I am an attacking player, and I normally play just behind the striker or on either wing,” said Powell, who is the Cobblers’ second signing of the January transfer window, following on from another loan man, George Cox. With West Ham making Powell available for loan, he was attracting interest from several clubs, but he has revealed boss Keith Curle persuaded him Northampton was the best destination for him. “The manager said to me that he was keen to get me started, and the biggest thing for me is to get games,” said Powell, who has been a regular in the West Ham Under-23s team in Premier League 2 this season, scoring seven goals in 15 appearances. 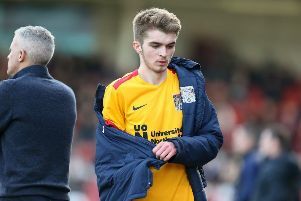 Powell has already met and trained with his new team-mates, and went to the Abbey Stadium at the weekend to take in the match with Cambridge United. Although that game ended in a heartbreaking 3-2 defeat, Powell saw plenty to admire in the Cobblers’ performance. “I went to watch the game on Saturday, and I was impressed and liked the way they tried to play football,” he said. If Powell does get the nod to take on Morecambe at the weekend, it won’t be the first time he has played at the PTS. As a 18-year-old, he made a second-half substitute appearance for West Ham U23s in a 1-1 Checkatrade Trophy game against Rob Page’s Cobblers, and he is keen to get out and play in front of a passionate crowd - something you don’t get in PL2 football. “I played here a couple of seasons ago now,” recalled Powell. “I didn’t start the game, but I came on, so I have played at the ground before, and I know the fanbase here is really good as well. “I have been at West Ham since I was a baby, since I was six-years-old.